Turkish Airlines is showing significant price reductions on their fares from Toronto to a fairly large number of destinations in Europe. Turkish Airlines is a highly rated airline. (Ranked #4 worldwide in 2015 by SkyTrax). 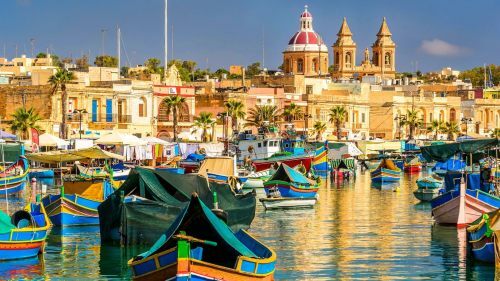 The flights to Malta & Greece are perhaps the most notable, as they are quite far south, and the climate is warmer in the off-season months of April/May than other places in Europe. Catania, Italy is also pretty far south, with a Mediterranean climate. Certain dates between late March and May 2016. To the destinations listed below, it's sometimes possible to extend the stop in Istanbul, and have it work out to a price that's similar, or not much more. UPDATE 1 - March 10 @ 11:53 AM EST - After disappearing yesterday, some of these seem to be re-appearing this morning, although with less available dates. Other destinations are likely to be working.on similar dates around this timeframe. If you spot any other destinations below $600 CAD roundtrip, help out your fellow traveler and make a comment about what you found (bottom of this post). 1. Go to FlightHub.com and search for a flight from Toronto to one of the destinations above. You may also want to try a 3 day flexible date search on Kayak, and click through from Kayak to the Turkish Airlines website - although it seems like the price shown on Kayak may jump up once you get to TurkishAirlines.com, from what I've seen so far (this could change). Different destinations may have slightly different dates that work out to a cheap price. The list below is a good starting point for the majority of the destinations. Dealing with a long stopover, either on the way there, or back - Turkish Airlines offers free hotel rooms or tours of Istanbul! Some of these flights may have a long stop in Istanbul, either on the way there, or back. You can try picking a flight option with a really long stop (24 hours) - to give yourself a full day to explore Istanbul, if it exists. Turkish Airlines actually offers a free hotel stay, *IF* your stopover in Istanbul is 10 hours or more, but *only* if a faster flight option does not exist. You can find more info at this link. OR, if you would like to use your layover time to check out Istanbul, Turkish Airlines offers free tours of the city. They even provide the transportation & meals! You can find more info on the free tours at this link. OR you can try searching for a flight with a really extended stopover in Istanbul (multiple days), either on the way there, or the way back, or possibly even both, and see if the price works out to be similar. 3. Change Luqa to one of the other cities from the list above. 4. I would recommend trying the dates from the list above for the 1st and 3rd flight. For the 2nd flight, play around, and see how it affects the price. Again, change Luqa, Malta to whichever destination you're interested in from the list above. Now we have 4 non-stop flights on our trip to Malta, with an extended stay in Istanbul in both directions, all for just $609 CAD including taxes. 5. Click through from Kayak to Expedia or Travelocity or FlightNetwork or whichever site is showing this price. toronto, yyz, flight deals, europe, northern europe, western europe, southern europe, central europe, nordic countries, eastern europe, eurasia, scandinavia, balkans, southeastern europe, turkish airlines and baltic states. 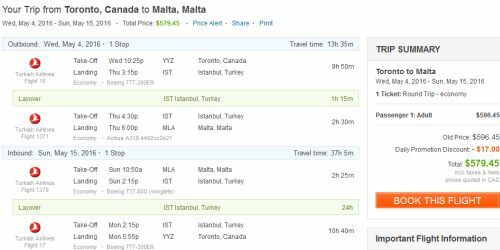 5 Responses to "Toronto to Greece, Malta, Czech Republic, Hungary and other European destinations - $579 to $599 CAD roundtrip including taxes"
Got $588 to Copenhagen in early April. Yass! Going to Malta with a long stop over to explore Istanbul. Chris you have done it again! ???? Have a great time in both places Merizzel! Istanbul is amazing. I haven't been to Malta but it's high on my list. It looks like a really interesting place, with a lot of historical sites and a nice climate.